Historically, women have always tended to do more piecemeal work – which fits around home and childcare – than men have, whether in “developed” or “developing countries”*. How do internet-enabled phones (or smartphones) fit in here? What kinds of quick, on the move income generation can these devices enable for women? And what implications does this have? We (Caribou Digital) recently did a big research study on digital lives” in Ghana, Kenya and Uganda for MasterCard Foundation as a client. I wrote another blog on it here. Our main question was – what are the internet-enabled or dataphone uses of young men and women ages 18-25 living on under $2 a day? (I’m trying to avoid the term smartphone again as that implies something top of the range, hi-tech). It may be a surprise to some that those living on under $2 a day have internet-enabled phones. But not only are mobile phones rates rising exponentially around the world (even a few years ago, Africa, was being called the “mobile continent“) but most internet connections in the world are also through mobile devices. As Jonathan Donner says in After Access “in many cases, people want and have mobile handsets anyway – to make phone calls, send a text, save photos and more – so the incremental cost to a user of acquiring a device with a data connection is often zero” (p. 56). This comes across very strongly in our Digital Lives findings – unemployed youth or those earning low daily wages were still investing in internet-enabled phones, getting the most out of wifi, sharing files through WhatsApp and other creative strategies to keep costs low. But what was particularly interesting to me was use by the young women – for earning money (I’ll discuss other impacts on women in future blogs and publications). 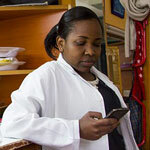 On the one hand, we saw evidence of the phone supporting work – for example, Melanie above in Kenya. We found other young women buying and selling shoes, clothes and other articles on a small scale through WhatsApp and OLX. This was similar to when I was travelling through Cuba in December 2015, and met a few “middle-class” women who said this is how they preferred shopping for clothes which were more interesting than the state offerings – a contact would post photos of new clothes consignments in a WhatsApp group and organize viewing and sales in their house. Selling goods and services through social media is echoed again in the impressive UCL WhyWePost study on social media in nine countries. In China for example, one woman says she prefers to buy make-up through WeChat rather than Taobao because the former is linked to a personal profile (potentially more trustworthy). Another woman, Dee, a farmer’s daughter, talks about how she installed broadband in her house when on maternity leave and now sells eggs to her colleagues through WeChat. She says “it seems like everyone sells something through their WeChat profiles”. In the same UCL study, Shriram Venkatraman finds that educated young mothers use WhatsApp to sell home-made snacks or advertise music lessons in India. Venkatraman says: “An advertisement for an affordable home made snack at around 2:30 PM on a community based WhatsApp group, attracts a lot of customers, several of them being loyal and repeat customers. Similarly, an advertisement for snacks at 6 PM is for the tired spouse who is back from work. Sometimes these snacks are even home delivered within the apartment complex for those who might not be able to pick it up”. The President of the World Bank, Jim Yong Kim, recently wrote in his foreword to the World Development Report 2016 that “new technologies allow women to participate more easily in the labor market” (p. xiii). Donner’s six affordances of a mobile could all facilitate this: inexpensive devices, usage-based pricing, wireless connections, personal devices, universality (being connected to everything) and phones being task-supportive. In the India example above, Venkatraman writes that “the speed of response (though asynchronic – its almost assumed to be synchronic), ease of access to the media (over mobile devices), and economy of using it are a few significant variables which speak to this preference for WhatsApp”. WhatsApp may be the most common means of buying and selling goods – and we need more research on other types of income generation but Premise is another initiative to keep an eye out for. Wired Magazine recently began an article on Premise with “in the Butantã branch of Extra, the Brazilian supermarket chain, in the western suburbs of São Paulo, Sandra Morais, 37, is taking photos of bags of rice”. Recently awarded with $50 m venture capital, Premise recruits thousands of human data trackers like Sandra (at last count, 200 towns in 30 countries) to gather observations in the marketplace on what products are available and how much they cost. The trackers take photos on their dataphones, aggregating to big data for Premise, which the organization can interrogate to forecast trends, e.g. inflation. The Wired article states that Sandra earns around £60 a month. The question is, if women are traditionally grocery shoppers, could crowdsourcing like this be a plausible and increasing source of income generation? Similiarly, Nanjira, a Kenyan participant in our Digital Lives study, summed up what the process looked like for her: “you can be creative about something then you post it, then people will like it and then you write there your phone number and you get rich”. The linear cause and effect omits all the skills, context and contacts needed to get from one point to the other. Linda and Nanjira are therefore very different to Sandra, above, who takes photos for Premise in São Paulo. It is this intersectionality that Dorotea Kleine reminds us we should constantly be aware of when we talk of “women, ICTs and development”. The GSMA’s 2014 study on women and mobile broadband distinguishes some interesting user segmentation of women, which I’d like to explore further. But the GSMA report as well as our study reminded me of a point made that when mobiles are introduced, it is a question of change of degree, rather than structure (blandly, the rich may get richer). Would this also apply in the case of women, who have all too often been lumped together in “ICTs, development and gender”? How are these digital skills learned? Formally or informally? As 23-year-old Winston in our Digital Lives study says: “not everyone can be able to operate a mobile phone, there are some who have never used at all, so when it comes to the smartphone it’s expensive for them to buy so for the future I think the companies can be able to provide education sessions for people who can’t operate the phones”. Will it be the companies, will it be NGOs or is it already women teaching themselves how to earn money through this device? What parallel financial mechanisms are being/will be used? When I showed the video of Dee selling eggs in the WhyWePost study to my class, some of the Chinese students clarified that WeChat currency can either be used virtually within WeChat or linked through to physical currency. This would also be the case for mPESA or other mobile money – how does this impact of women’s financial status? As a recent post from the Cherie Blair Foundation says, increasing numbers of women are likely to use digital payments. In our Digital Lives study, my colleagues pioneered the concept of the Digital Day – what kinds of mash-up of devices, networks and tasks were being executed throughout the day? This would be especially interesting in terms of the peak times of use for income generation by women – is it when the children are at school? Early morning? How can this data be helpful and to whom (to NGOs but also advertisers for example?)? At the same time, in our critical journal paper, Rachel Masika and I caution that we shouldn’t applaud ICTs as immediately empowering for women because women may use techniques like “adaptive preference”, i.e. not using their phone at home if they feel this angers the men or senior women. For example, one respondent in our journal paper, Fatuma, a 32-year old female pavement trader around the central market in Kampala, says “at home if you see that the phone won’t make you free, it is better you stay without it. Because there are men who are full of anguish that he can demolish that phone the moment it rings because he does not know the caller number and then he tells you that if you want peace in the house, stay off the phone”. Tacchi and Chandola also caution that women’s use of phones must be understood within the cultural contexts (fighting against family conservatism for example), gaining fascinating insights into the lives of Payal, Rani and Monica in Govindpuri, a Delhi slum. Do we see more evidence of such negotiating behaviour with dataphones? Does it intersect with the Digital Day? Should income generation through mobile internet, e.g. social media, be regulated? When I discussed this with my students, the overwhelming response was “no”. They argued that it would stifle innovation, creativity, that income in most cases would in any case still be small, and women would want to keep this money for themselves. However, in the case of Amazon’s Turk for example, there have been complaints of exploitation. Similarly, what “dark” sides of income generation are there? One male respondent in our Digital Lives study was telling his female friend to pose on Instagram, with some hints on how she could “market her body”. No doubt this is already happening, but what protection might such women need? And then this of course leads back to the question of – what is the responsibility of platform providers, like Facebook, WhatsApp, OLX and others? As you can see these are very disparate thoughts around a topic I would love to do more research on. Clearly internet-enabled phones have great potential as well as risks for income generation for women (while always bearing in mind that a very small proportion of the female population across the world do have them). What rigorous research on this exists and what do we need to do? Comments welcome. Thanks to Susan Scott for inspiring this!